I was stuck. How do I explain decoupling capacitors to someone who doesn’t know yet what electricity is? I said something garbled about getting rid of the part of the electricity we don’t want. He accepted my explanation, but it bothered me. He wanted to know about electronics, but I didn’t know where to start. After several wrong turns while searching online, I found Oscar and the Bird, by Geoff Waring. The book was perfect for us. Oscar, an inquisitive kitten, is surprised one day when he accidentally turns on the windshield wipers in a tractor he is exploring. “Will you show me something, Daddy?” asked my three year old son as he padded down the basement stairs and scampered to my workbench. Forever wanting to know how things work, he likes to sit on my lap and look through my magnifier lamp at whatever is on hand. On hand that day was my NorCal 40A. I popped open the clasps on the lid and opened it up, and the questions began. “What’s that, Daddy?” He pointed to an LM393 op amp. Then we got into dangerous territory. With just a few tweaks, I brought up the “IambicV” iambic keyer core on one of my A3PN250 breakout boards. I was stunned when it made dits, dahs, and iambic dah-dits perfectly the first time out. Yes, I know that’s what a testbench is supposed to make possible, and yes, I’ve had it happen before, but I still always expect smoke the first time I turn something on. I made a few changes from last week’s version. I made a few changes from last week’s version. One change was to invert the dit and dah pins. Although high-true logic is convenient within the keyer module, it seems like a good idea to have the actual paddles grounded, so the inputs had to be low-true. The physical constraints file enables the built-in pull-up resistors on the dit and dah pins. 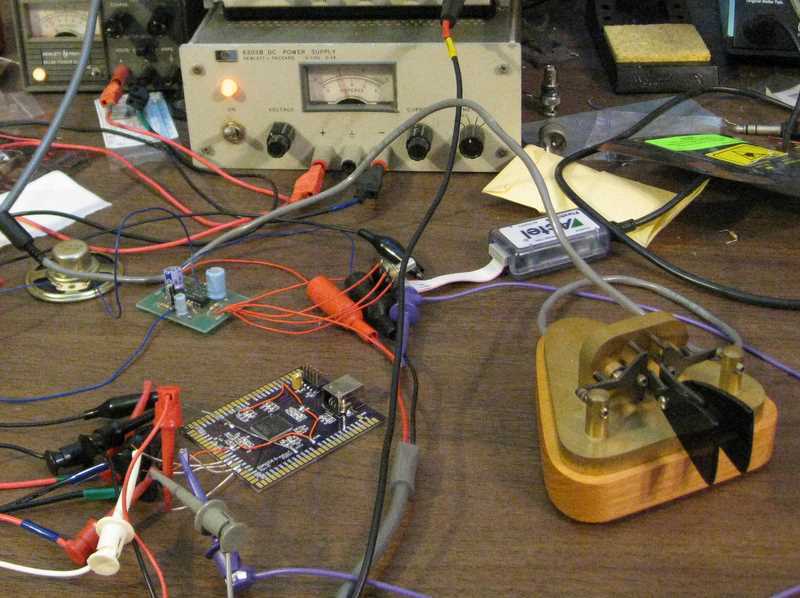 For an audio amplifier, I used an old Saint Louis QRP Society LM380 board. It’s all lashed together on my bench, but it works. To download the core, see the iambic keyer project page. If my goal is to build an FPGA-based ﻿ham radio, one of the modules I can’t do without is an iambic keyer. I have to confess that I have never been much of a CW (Morse code) operator, but with so many logic gates available, it would be a shame to leave out a keyer. Writing an iambic keyer turned out to be a good way to get the kinks out of the FPGA toolchain. The code itself is pretty simple and straightforward. One flip-flop keeps track of whether the current symbol is a dit or a dah. Another tracks whether the paddle for the opposite symbol (dah or dit, respectively) has been pressed during the current symbol. Finally, a two-level counter handles the timing of the dits and dahs and operates the key line. There is a simple sidetone, too. The FPGA level shifter: not entirely crazy! Some months ago, I came across an Actel app note that advocated using FPGAs as level shifters. “What a crazy waste of computing power,” I thought to myself, “though I suppose they are just trying to sell the low-end ProASIC3 nano FPGAs.” With that, I set the thought aside. Much later, I ran into a problem.